When December began I wasn’t sure of my word for 2015. Usually the right one floats up into my consciousness as the year draws to an end but this time I needed more time to reflect. Creating — and doing — the Find Your Word mini course was SO helpful (and fun! I love the community that’s been created). There’s always been mindfulness and intention behind my word choices but this year I’ve had the chance to delve deeper into the whys of my choice. Some of my previous words proved to be wildly empowering — BRAVE, EXPAND and OPEN were all dynamically useful words that helped me create change in my life. Other words have been less helpful: COMPASSION, for example, was a bit of a cop-out in 2011. The more I do this practice the more I understand what works and what doesn’t — and why it’s such a valuable thing to do each year. NOURISH. Oh my goddess, yes. This is my word for 2015. This is going to be the year of absolute self care in the best possible way. I’m at an age where I see that no one else is going to look after me — and I don’t want them to. I spent my 20s wanting someone else to, but that’s just not how it works. I am in charge of me and my life. I am responsible for making sure I am looked after. And so NOURISH is going to help me really sink into what this means — and most importantly, implement it in my day-to-day life. All decisions and choices this year will be passed through my “is this nourishing?” filter. Work and play, love and life, everything. What is most nourishing for me in this situation? In this friendship? In this business decision? In this choice I’m making? What’s the most nourishing thing I can do for myself right now? This week? This month? Today? And most of all, in all things, in everything: If it’s not a hell yeah, it’s a no. Full stop. NOURISH includes but also reaches much further than food and nutrition. It’s how I care for my body and mind, my heart and soul. It’s how I treat myself — and how I let others treat me, too. It’s boundaries and rest. It’s an open heart and the relinquishing of expectations. I also have an inkling that NOURISH will be woven deeply into the work I share this year. I can already feel it as I journal my way through plans for my business: A meditation album. An oracle deck (finally!). A delicious new course. A new website. All of it nourishing for me and nourishing for YOU. I reached the end of 2014 depleted and bone-tired. I’m so ready to be nourished from the inside out. What is so cute is that you mentioned my word which is INKLING. This year I didn’t want to set too high a bar for myself and get carried away with “achieving” it. SO I understand totally about NOURISH as a contradiction to all that, it’s a gem. INKLINGS are hunches, hints and intimations…..vague but curious and mysterious maybe? I’m delighted with it! I have loved the FB group this year Susannah, its been so great to see so many people there as well. My word this year is give. I’ve had a tough couple of years of feeling closed up and hiding away – so this year I want to give it my all. And it feels so right and such a huge reminder to not close myself off or hide away with my fears. It’s generous to others but also (and importantly) to myself… I think I mentioned this on your Instagram but I’m going to try to give up resentment (forGIVE) as well and move on from the last couple of years as well as I can. This year’s word for me is ENGAGE. I’m doing a street photography project and since I am naturally a bit shy I thought this word was just perfect. Congratulations on your word. Wishing you every single thing that will make this word your truth this year, a nourishment that will fill you in every way. This is my word for the year, too! It’s such a rich word. Nourishment for my body, mind, soul, relationships…and even finances. Here’s to our nourishment in 2015! May we be all the healthier for it! This is my first time choosing a word for the year, and it has been so enlightening … I worked through the exercises and let things percolate and simmer, and the word that emerged and stuck is MOVE. In the literal sense, I have to move house at the end of this year – love where I am but far too expensive, and I’m determined to find an equally soul-nourishing nest somewhere. I’ll also be moving my daughter hundreds of miles to graduate school – big life change for us both! Moving my body is big this year too – and it’s the perfect word to arm myself with as I do battle against my least favorite habit – procrastination. Moving up, moving on, moving and shaking, it’s my move this year! REAL sound authentic and powerful – yes! Mine is ALIVE. It took me a while to get there, going through 3 or 4 other words first, and it’s a lot to live up to, but what it brings forward for me is my desire to consistently choose what brings me most alive this year. 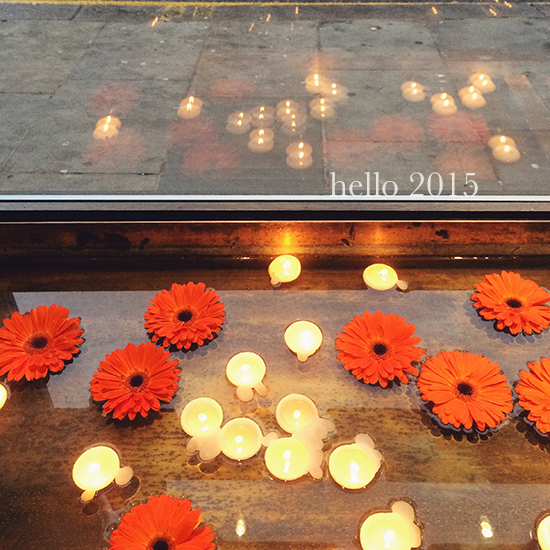 I experienced a good amount of aliveness in 2014, and I’m hoping to do the same this year. It’s not clear at all how that may come about, but I’ll keep my eyes open for it. Good luck with your words, everyone. Last year was a Nourshing-introspective-self-love kind of year. :) It was much needed and helped ground me and put me in a more centered place. From that place I felt the pull for more action-oriented intentions, so my word for 2015 is CREATE. My word for 2015 is having a GOOD RELATIONSHIP TO MYSELF and thus being able to stand up for myself. LISTENING wholeheartedly to my deep inner self and truth and wishes – and bringing them into my life. As every, you are totally inspiring, Susannah! Your wise words have got me through some tricky patches..
As I haven’t done this for many years, I thought 2015 could be my time to THRIVE and I love your idea of the “filter”! Thank you and all the best for your complete nourishment! Love your word! I choose this one as well! I need to take care of myself (usually take more care of others) and feed my spiritual life. Share will come with. Thank you for the exercise it is great! Your word is fantastic! I can feel how much you resonate with your word. 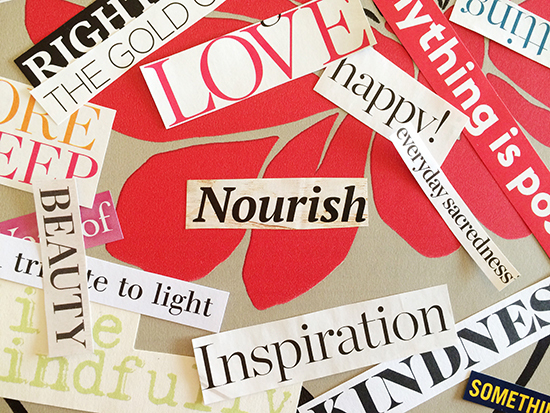 Nourish will be front and centre in your life in 2015. After doing the mini word course and still pondering my word, I had an intuitive hit. The word was serenity. First response was “really?!”. I let things be and puttered in my office. I pulled out a drawer and a piece of paper had ‘lavender serenity’ written on it. I was putting something on my altar in my office and looked down at my Self Mastery Card that I had pulled weeks before. The word was serenity. There was a double confirmation from the Universe and I am thrilled with my word for 2015! All the best! It’s taken me a long time, too. But I think one clicked the other day when I saw it written: Transcendence. “Far better or greater than what is usual.” And I’m keeping it in verb form to remember it is an action. My word for the year is freedom. Last year my words were In to the wilderness. I March last year I handed in my resignation and were supposed to have my last day at work 30th of June. I was asked to stay for six more months because of a client we had. I said yes and now I am finally free. I have used this week starting a new blog, a new IG account and a facebook page for my (dream come true) photo business. I am easing in to self love and believing that I can do this. My dream is important and I am the only one who can make it come true. Lovely to read of everyone’s journey to their word. Last year’s word for me was ‘rebirth’ after a couple of rubbish years for all sorts of reasons and it really stayed with me, though took all year to get close to it! So this year I’m ‘flourishing’ – after lots of pondering it suddenly came to me, a moment later I tidied a long left pile of books away and there was the second from top title -“flourishing”! Thank you so much Susannah for your gentle interventions and guidance for life- hope as much nourishing as you need comes your way- though Noah-nourishing will likely be the best!! My word for 2015 is Adventure life is one and I wanna live! I needed something with energy and edge. I love your word for this year! I think we can all take more time to focus on ourselves and our needs. My word for this year is PRESENT. I find myself focused so much on what will happen that I don’t take steps to make things happen today. So I want to think more consciously about being present in my day-to-day life, whether it is what I’m reading, what I’m eating, how I stay in touch with friends and family and just getting things done in the moment instead of making grand plans and never finishing them. Thanks to your gentle, amazing guidance, my word is Soulshine. This is my first time choosing a word and you have NOURISHED my soul and allowed it to begin shining once again. Thank you and I hope that every part of you is nourished in the coming year. Fabulous word! So many facets of our lives where we can chose to nourish ourselves. I’ve enjoyed the FB group this year. My word for 2015 will be CONSISTENT which I’m hoping to apply to all of the things I do sporadically that I should do consistently. My word for 2015 REVITALIZE. And a little word to go with it is gently. Think of a fresh glass of water or some fresh clean air blowing through my life, my thinking, my relationships, my wardrobe! Thank you Susannah. I found the December prompts really found their own story. A new idea for me. Hi Susannah – like you, it took me a while to find my word this year. It came to me as I was quietly chopping peppers for my dinner last week, realizing how much I was enjoying the simple process of meal preparation….PRESENCE. As an introvert, I spend much of my time reflecting on the past or imagining a future that hasn’t happened yet, so I tend to miss the beauty & simplicity of the present moment. So this year, I will gently hold PRESENCE as my beacon. Thank you again for your generous and heart-felt blog posts. You are a kindred spirit to many. That is a wonderful word… I hope you find in it what you are looking for. Taking better care of myself is part of my own personal goals this year (I’ve been known to forego showers because of crying babies and eating standing up), but we decided to go with a mission statement this year which was to take our life and passions to the next level. I’ve quit my job to be a full time mom, we are transforming our urban home into a homestead and we are taking a vow of voluntary simplicity. It was in the works in , but is the start of much bigger things! Happy New Year to you and I which you an amazing year! absolutely loved the “find your word” course, susannah! my word for 2015 is ESPRIT – and i am already embracing the energy and animation it is bringing to my life. (just wrote my own blog post all about my reasons for choosing it. :) ) thank you for your inspiration. I like your word, give the idea of growth and focus on yourself. For me this is the first year that I search for a word (actually, I just posted my journey on that), but 2015 must be the year for new things. Because 2014 went way too bad. My word for 2015 is Vibrant! I love your word (I also adored your choice of miracles last year). Of course, I am a believer in taking care of ourselves at any cost. I do hope nourish serves you in the best possible ways. I adore your word. I understand a bit about cop-out, or choosing a word with an agenda. That’s what happened to me last year with JOY. I didn’t want to choose anything ‘scary’ but it backfired, because I had to face a lot of scary to reach my joy. This year, the word came to me. SPARKLE. It’s the beginning of my dance with sparkle. I can’t wait to see the glittering gifts she’ll bring me. My CDF’s are Nourished, Ease, Wealthy, Elegant. This is the first year I’m doing a word for the year… INTENTIONAL. My word this year is flow………. I love the word ‘nourish’. This year, my word is ‘fulfill’. My word for 2015 is FLOW. Both mentally and physically I need to slow down and let life flow instead of being harsh and pushy. Making choices deliberately and going with the flow. With that thought I want to declutter my space and work on parting with things and creating an open flowing space in my home. This year, my word is THRIVE. Last year was reverence, which I have found in abundance for myself and for my path. So this year I plan to thrive in all of it. In regards to your “nourish”, a good friend of mine gave me the perfect mantra this past year during a reiki session. “Does it add to your sparkle? Does it make your soul shine?” Been asking myself that often ever since :) Here’s to an all encompassing nourishing year for you! My word for 2015 is ACTION. Mine is CURATE. Usually this word is associated with museums, but for the past few months I’ve been thinking about it in terms of curating my life. I feel like I’ve been too complacent, too willing to wait for life to hand me (or not) things to make me happy. I sometimes catch myself just going through the motions of life. I want to live a curated life; a life of mindful decision making and created happiness. To emphasize that end, I chose to deliberately color only half my mandala to remind myself that it’s not only the addition of things that make a curated life but also the willful and deliberate absence as well. I want to weed out the things that don’t make my life spectacular and start making more mindful decisions on pursuing things that do. Oh… Nourish feels so good. It’s right up there with nurture. My word for 2015 is sacred. Similar to your relationship with nourish, I’ll be measuring my options and activities against sacred to determine if it fits in my life. I’ll be respecting myself and others as sacred, especially this year. It’s always interesting to see how my relationship with my word evolves over the year. I’m excited. Want a lovely interesting idea- thanks for the inspiration! I did the exercise you created to find my word, Clarity, for 2015. I’m a very visually perceptive person but I’m a dreamer (a Pisces) and my recent Oracle card was The Moon. I’m tired of feeling like I am not coming to terms with what reality has given me. I need to look up, away from my own disillusions, and truly see my potential and MAKE it a reality. This year I need to see: truth, hope, reality, CLARITY. Thank you for the help. Here’s to 2015! There’s a lot to get through in the first half of the year that will require focus, and the rest is going to be a bit of a free-for-all… but I don’t want to waste it. Clarity is what I need to get me through the tough part (taking on a promotion while finishing Uni in August) and through the relaxing part (winding down after Uni and allowing myself to get a feel for what I want to do with my new skills in 2016). I also need clarity to keep me away from toxic friendships, and so far, it’s working! A scary and thrilling word! I am going to own it (ownership was second runner-up) and live with radiance. Here’s to 2015, click!